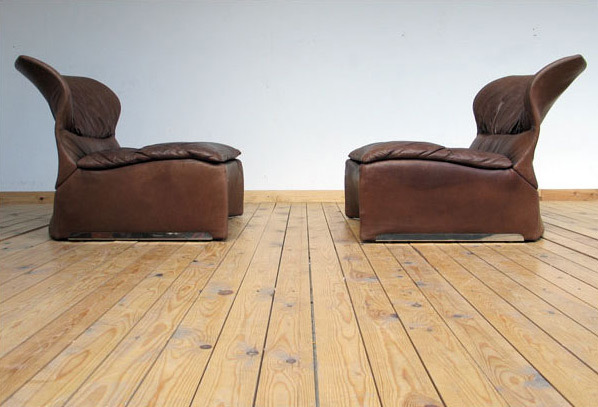 2 Italian design sofa's Saporiti, model Vela Bassa designed by Giovanni Offredi. Finished in brown leather, back support has the shape of a wing. On the foot finished on both sides with chrome. Underneath marked with 'Saporiti Italia Vela Bassa'. Would fit in any Modern Italian interior. 2 Fauteuil design Italien Saporiti modèle Vela Bassa conçu par Giovanni Offredi. Finition cuir brun, le dos en forme d'aile. Pied avec finition au deux cote en chrome. Le dessous et marque "Saporiti Italia Vela Bassa".